Posted on 15, July 2016 by EuropaWire PR Editors | This entry was posted in Awards, Education, Science, United Kingdom and tagged British Academy, Kelvyn Jones, Professor Kelvyn Jones, Sir Paul Nurse, University of Bristol. Bookmark the permalink. 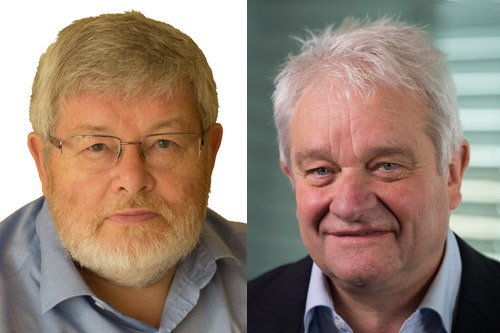 Sir Paul Nurse, the next Chancellor of the University of Bristol, and Professor Kelvyn Jones of the School of Geographical Sciences and the Centre of Multilevel Modelling, have achieved the distinction of being elected Fellows of the British Academy. BRISTOL, 15-Jul-2016 — /EuropaWire/ — At its Annual General Meeting yesterday [Thursday 14 July] the Academy welcomed the 42 new UK Fellows elected for their eminence in research and publication. Professor Jones’s election as Fellow of the British Academy reflects the cross-disciplinary nature of his work to both sociology, demography and social statistics and to anthropology and geography. In addition to the UK Fellows, the British Academy elected 20 new Corresponding Fellows from overseas universities in the USA, Australia, Spain and Germany. Four Honorary Fellows were also elected: Sir Paul Nurse; Lord Sainsbury; Justice Kate O’Regan and the Honorable Janet Yellen. Honorary Fellows elected have ‘contributed signally to the promotion of the purposes for which the Academy was founded’, either as persons of academic distinction in other fields whose work has a bearing on the humanities or social sciences; or as leading figures or philanthropists who have themselves done distinguished work in the Academy’s fields of interest or promoted or advanced the causes for which the Academy was founded. The Academy is the independent national institution for the humanities and social sciences. It is the UK’s expert body that supports, speaks for and spans the full range of subject areas from history to psychology, economics to law, literature to philosophy and languages to archaeology. Election is a mark of distinction, as only a very small number of scholars in any field are elected. Professor Jones’s pioneering research ranks him as one of the world’s leading human geographers. Recent work with colleagues has including successfully forecasting the EU referendum results for the areas on which they are announced – a correlation of 0.82 between actual and predicted leave vote was achieved; a study that showed that lack of growth preceded debt rather than followed, thereby casting doubt on austerity programmes being imposed on countries like Greece; and work that showed that ethnic segregation was much lower than in USA and against much popular commentary was decreasing over time in the UK. One recent piece of work that started as an undergraduate dissertation involved the quantitative analysis to find the best Formula 1 driver of all time, taking account of team performance and under different racing conditions. Team effects were shown to be more important than driver effects, and increasingly so over time, but their importance reduced in wet weather and on street tracks. This received over 2.7 million twitter views after being re-tweeted by Fernando Alonso and Alain Prost and appearing in 70 newspaper outlets worldwide. Earlier in his career – and also recognised in his election – Professor Jones made significant contributions to the study of the geography of health. This work focused on the geographical inequalities in mortality in advanced economies and has involved following a cohort of 9,003 individuals since 1985 and examining the nature of place effects, particularly the mortality of ‘poor people in poor places’, poor people do indeed die young, especially if they live in poor areas. Sir Paul is a leading geneticist and cell biologist. His work on the control of cell division underpins current research into treatments for cancer and other serious diseases. His contributions to science were recognised with a knighthood in 1999. In addition, Sir Paul’s endeavours relating to the discovery of molecules that regulate the cell cycle saw him jointly awarded the Nobel Prize for Physiology or Medicine in 2001. Over the last 30 years, Paul has held many senior research leadership roles, including Director General of the Imperial Cancer Research Fund (now Cancer Research UK). He was appointed President of Rockefeller University in New York in 2003 and was elected as President of the Royal Society in 2010 for a five-year term. Since 2011, Sir Paul has been the Director and Chief Executive of the Francis Crick Institute, a London-based biomedical research institute which opened in 2015. Sir Paul Nurse FRS, and Professor Jones FBA, join Emeritus Professor Peter Haggett and Professor Ron Johnston of the School of Geographical Sciences and Professor Harvey Goldstein and Visiting Professor Fiona Steel of the Centre of Multilevel Modelling who are long–standing Fellows; a testament to the world-class research environment at the University and the distinctive expertise in quantitative social science. Kelvyn Jones holds a BSc and PhD in Geography from University of Southampton. Before joining the University of Bristol he worked as Professor and Head of Geography at the University of Portsmouth. He is also a Fellow of the Learned Society of Wales, Fellow of the Academy of Social Sciences, and in 2013 was awarded the Murchison Award, the senior award of the Royal Geographical Society. He was appointed as a panel member for Geography and Environmental Studies for two Research Assessment Exercises and led the RAE/REF submission for the School for the last two assessments when the Bristol geography department was placed in first position, a position it has occupied in each and every assessment exercise since its inception. The British Academy for the humanities and social sciences. Established by Royal Charter in 1902. Its purpose is to inspire and support high achievement in the humanities and social sciences throughout the UK and internationally, and to promote their public value.